The Memphis Grizzlies pulled off a stunning 111-110 win over the Sacramento Kings Thursday night. The Grizzlies were down by as much as 17 in the fourth quarter when they used a 16-1 run to get back into the game. They had to play the foul strategy down the stretch, forcing the Kings to hit their free throws, which paid off. 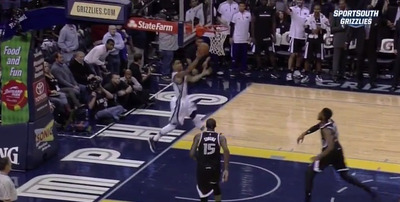 Kings guard Ben McLemore missed two huge free throws with the Kings up 110-109. The Grizzlies secured the rebound with .3 seconds left, advanced the ball with a timeout, and had to hope for a miracle. 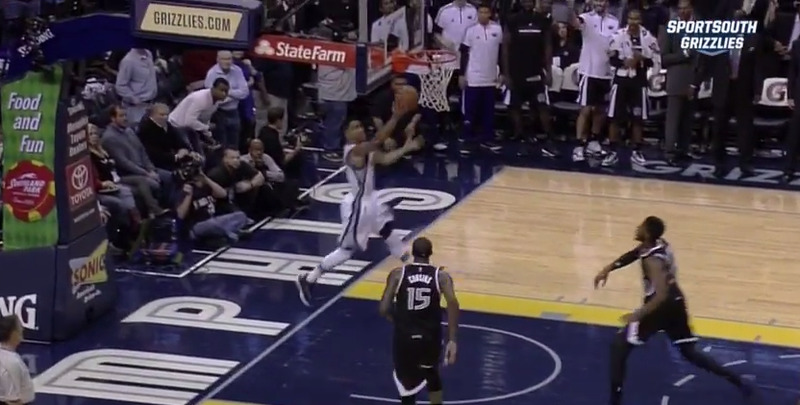 Vince Carter lobbed it up toward the basket for Grizzlies guard Courtney Lee, who caught the ball in midair and reversed it in to win the game. The shot didn’t come without drama, however. The referees not only had to review that Lee got the shot off in time — it was a pretty long .3 seconds — but the Kings Ryan Hollins who was guarding the inbounds pass argued that he tipped the pass when Carter released it. If he did touch the ball when it was released, the clock should have started sooner, and Lee’s shot never would have counted. The replay is close, and it does look like Carter’s pass suddenly fell short once it got past Hollins. Ultimately, the referees ruled that Hollins didn’t touch the pass, and Lee’s layup counted.